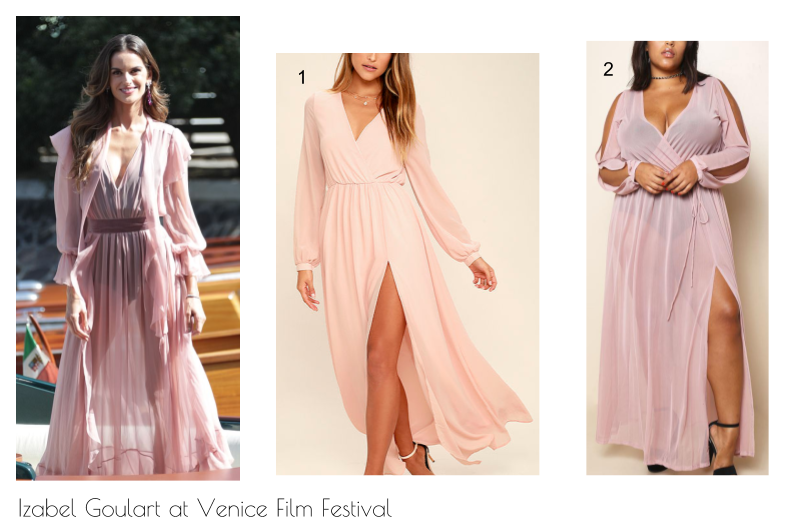 Izabel Goulart was all pretty in pink today at the Venice Film Festival. The Brazilian model wore a pink semi-sheer long sleeve dress, looking radiant as ever. I love how innocent the dress looks on her, as it shows off very little skin. Even though the dress is semi-sheer, Izabel still leaves something to our imaginations by choosing to wear a body suit underneath. With this weird transition weather happening while it’s still technically summer, this is the perfect dress choice for a fancy dinner or party. See below for two dresses inspired by the look. 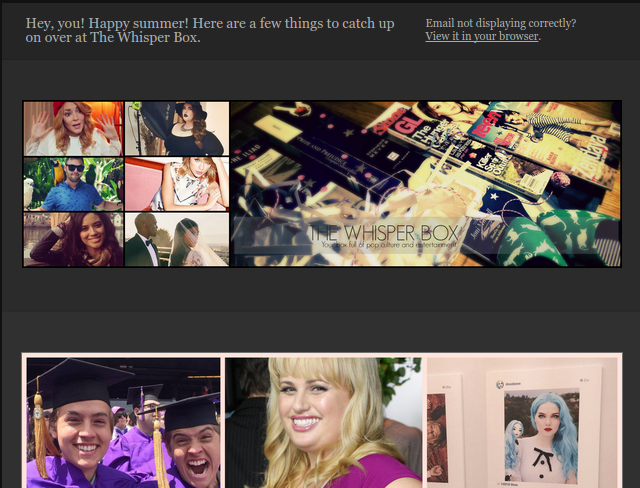 Sorry for the abrupt hiatus announcement last week. I was chillin’ on the beach in Puerto Rico (vacay photo diary ETA tomorrow evening) and I completely forgot to find some guest bloggers to take over while I was away. Anyway, this week’s Wardrobe Wednesdays features our favorite Glee drama queen Rachel, played by Lea Michele. 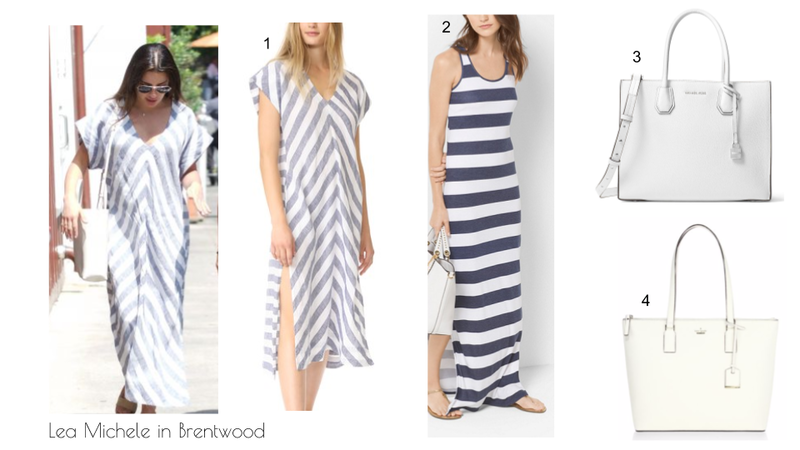 While in Brentwood a few days ago, the actress was spotted wearing a blue and white striped maxi dress with a white tote. Somebody is testing Labor Day outfits early! I just love how effortlessly summer this outfit is. It has a nice nautical feel and looks quite comfy. 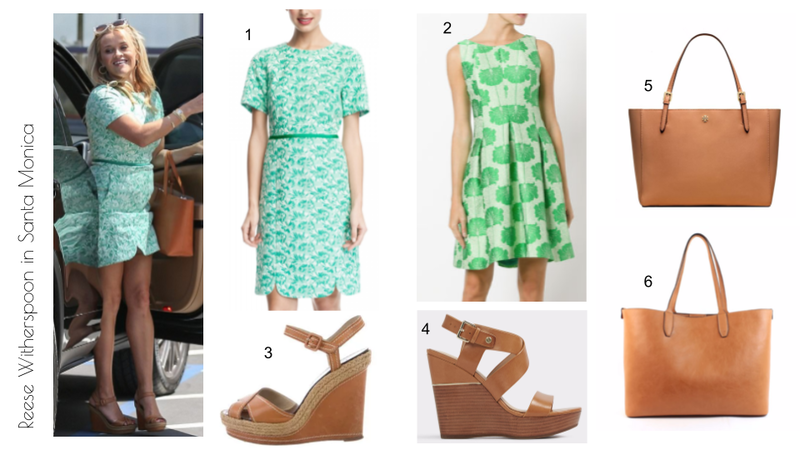 See below for the original dress (marked with *) and a few other items inspired by the look. Reese Witherspoon was spotted last week in another Draper James piece while in Santa Monica. The actress wore a white and sea green jacquard dress with cognac wedge sandals and a tote bag to match. I love the color combo, as it oozes earth tones! I would never personally think to pair white and green with tan but I really love the way it looks on Reese. 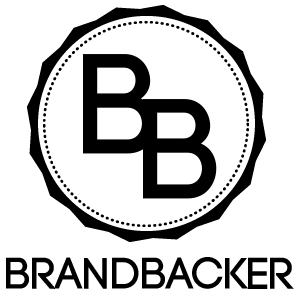 See below for the original items (marked by *) and alternatives to steal the look. Model Martha Hunt was spotted in New York City a few days ago wearing the cutest little mini dress! 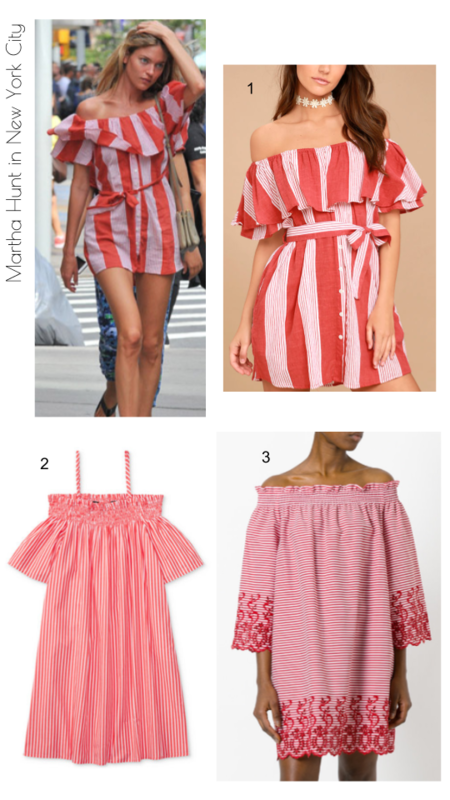 Her off-the-shoulder frock by FAITHFULL THE BRAND features red and white stripes, which literally scream hot summer days. Ladies in NYC, take note of dresses like this for sweltering 90° days! Below is the original dress (marked with *) and two others inspired by the look. Summer officially begins next week, and Olivia Munn is wasting no time breaking out the mini skirts for the occasion! The actress was spotted in New York City dressed in head to toe sporty chic as she wore a leather mini skirt, graphic tee, and black hi-top sneakers. I love how daring the mini skirt is! The embroidery on the mini skirt is also a really nice touch combined with the Bella Freud ‘Anita’ t-shirt. 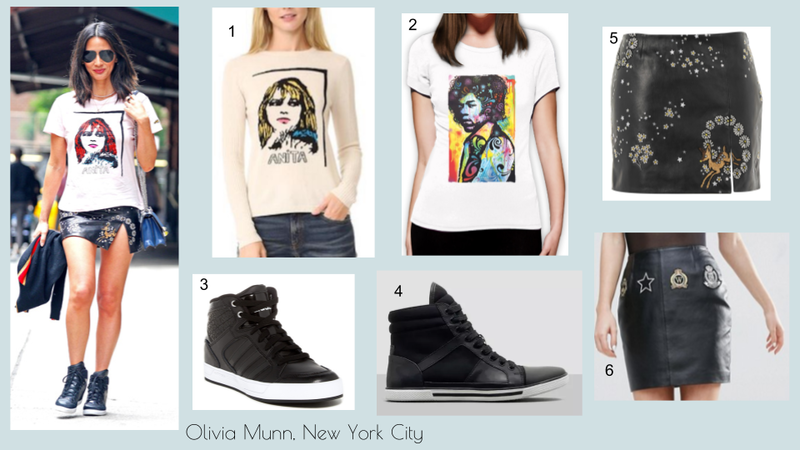 See below for the original items Olivia wore (marked with *), as well as some alternatives to help you steal this super cute, laid back summer look! Priyanka Chopra is making me want it to be summer already, especially with this 85°F NYC weather today! 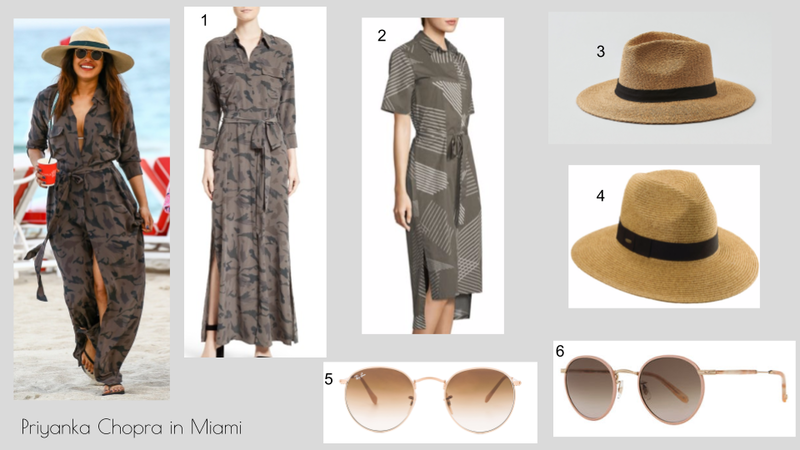 The actress was spotted on the beach in Miami covering up her bikini in a military gray shirt dress, fedora and shades. When I think or bikini cover ups, gray isn’t the first color that comes to mind, but I’m kind of liking this subtle summer vibe with military print she’s got going on here. Below are some of the original items that Priyanka Chopra is wearing (marked with an *) and a few alternatives. Kristen Cavallari was a vision dressed head to toe in grey with splash of white on one of the last days of 2016. She paired white pants with a long grey wool coat, grey sweater and grey suede tassel boots in a cute Instagram pic dated December 27th. 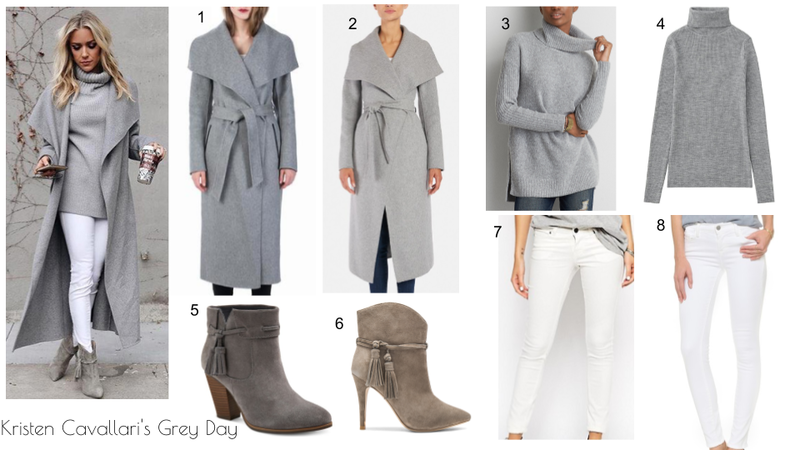 This is the perfect look for those winter days when you’re just feelin’ kinda grey. I don’t usually buy suede boots for the winter because the snow ruins them, but the tassels on Kristen’s are really making me want a pair! Below are some of the original items (marked with *) and alternatives based on this look.